PH.D. 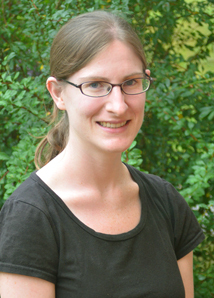 CANDIDATE Danielle Grogan's scientific career was cemented by her undergraduate research experience at Smith College, where she majored in mathematics and minored in geology. Her research project involved a little campus pond that perpetually filled with silt and had to be dredged every few years. 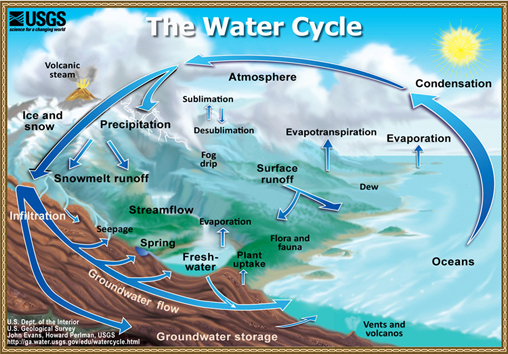 Grogan was tasked with figuring out why, and thereafter was hooked on the hydrologic-human cycle. Ever since then, water has been the constant running theme through Grogan’s academic career, which included a master’s in paleoclimatology from Brown University that focused on hydrological processes of the past. 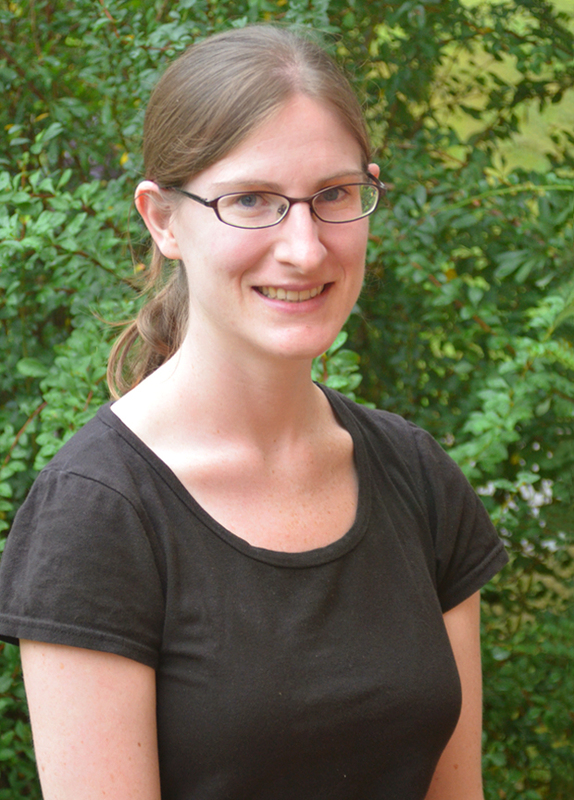 With the hydrologic-human connection having been forged by her undergraduate experience, three years into her doctoral work she is now blending her expertise in hydrologic modeling with social science and economics on a number of projects. In late August this year, Grogan returned from ten weeks studying in Japan on a summer research fellowship from the National Science Foundation’s East Asia and Pacific Summer Institutes for U.S. Graduate Students program. She worked with researchers at the University of Tokyo’s Global Hydrology and Water Resources Engineering Lab directed by world-renowned hydrologist Taikan Oki. The Japan Society for the Promotion of Science jointly sponsored the fellowship. Image courtesy of the US Geological Survey. Illustration by John Evans and Howard Perlman, USGS. For this project, Grogan is using two existing hydrologic models—UNH’s Water Balance Model developed by the Water Systems Analysis Group (WSAG) over a period of decades—and the University of Tokyo’s Catchment-based Macro-scale Floodplain model. 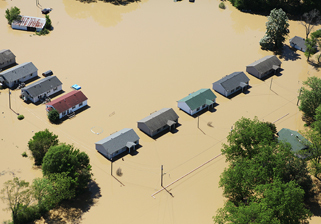 The combined modeling will address a specific set of research questions: How does changing land use from forest to agriculture alter flood risks; how does this compare to flood risks due to urbanization; and, how will climate change increase or alleviate these risks? The fellowship grew out of Grogan’s involvement in an NSF-funded project led by Earth Systems Research Center biogeochemical modeler Steve Frolking. 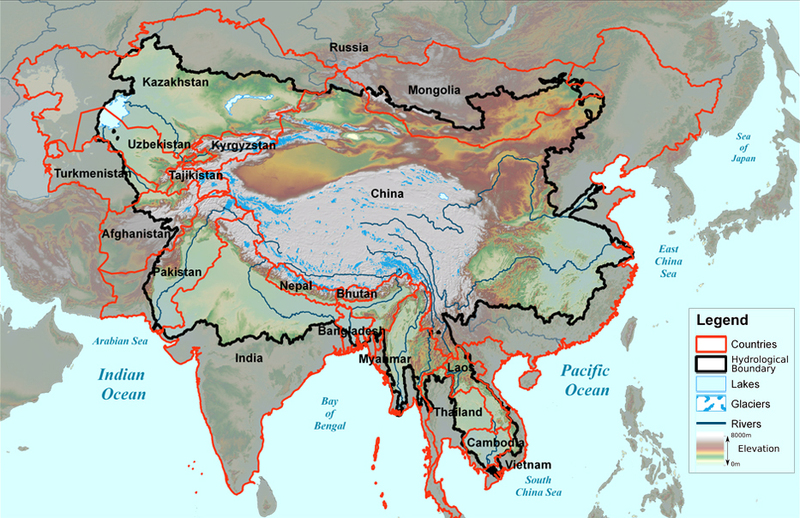 The project, titled “Crops, Climate, Canals, and the Cryosphere in Asia; Changing Water Resources Around the Earth’s Third Pole,” is part of NSF’s Water Sustainability and Climate program. ESRC’s Changsheng Li, Richard Lammers, and Dominik Wisser are also on the project. The Third Pole is the 2.5 million square kilometer Tibetan Plateau, and the $1.5 million multidisciplinary, multi-institution study is an assessment of current and projected water resources in the watersheds of the region’s major rivers, principally the Indus, Ganges, Brahmaputra, Salween, Mekong, Yangtze, Yellow, Amu Darya, Syr Darya, and Irtysh. Grogan has used the Water Balance Model to estimate how much food is produced in China as a direct result of irrigation systems that use mined groundwater. The Earth's Third Pole represents the largest and highest collection of mountain ranges in the world. Rivers originating here, fed by glacier and snowmelt, extend in all directions and connect these cold mountain regions with many countries around the Pacific Rim, the Indian Ocean, and Central Asia and supply irrigation water critical for extensive crop production and provide regional food security. Map by Dominik Wisser, EOS-WSAG. Grogan says that the Third Pole project doesn’t concern flooding, but a lot of the people in WSAG she works with are on the NSF-funded NH EPSCoR (Experimental Program to Stimulate Competitive Research) project doing hydrology modeling and focusing on the interaction between human systems and hydrology in the context of climate change. “I basically went to Japan to learn how to do the flooding component of hydrology modeling and apply it to the EPSCoR ‘Ecosystems and Society’ project, as well as add this capability to our group’s modeling efforts. The Water Balance Model does stream flow, soil moisture, evaporation, all these aspects of the hydrologic cycle, but we have not yet done any type of flood representation,” Grogan says. Before her ten weeks in Japan, Grogan wasn’t sure if she would end up using the flood model as a separate tool that would be paired with the Water Balance Model or if she would completely merge the two by re-coding the flood model into the UNH model. “I’ve concluded that I will re-code the flood model into the Water Balance Model, which will take a few weeks, and I expect to have it tested and validated by the end of the semester. I am also very confident that the flood model will apply to the EPSCoR project,” Grogan says. Alex Prusevich, a member of WSAG, is also involved in re-coding the flood model. She notes that she was able to “sort of attach myself” to the EPSCoR project because she’s had additional funding through the NSF Graduate Research Fellowship Program that has allowed her the freedom to participate in multiple projects as they fit into her dissertation. 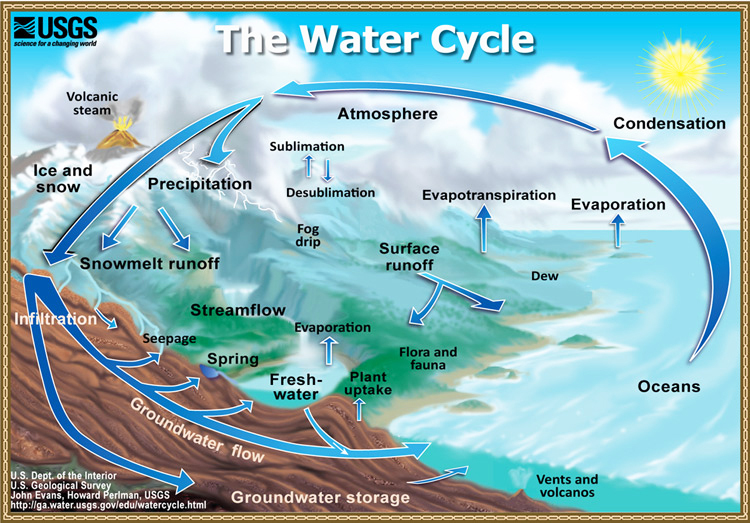 The UNH Water Balance Model represents the basic dynamics of the hydrologic cycle and moves a known quantity of water from point A to point B. The flood model can show not only if a flood occurs, which the UNH model can also do, but what the spatial extent of the flooding is, and how deep the flood waters are at different places in the floodplain. Grogan hopes to take the modeling work she began in Japan and apply it to what flooding would look like in the EPSCoR project domain under different climate change and land use scenarios. Developing a suite of scenarios that project into the future is a critical component of the Ecosystems and Society work. These scenarios will provide plausible "storylines" on how land cover and climate might change across N.H. over the course of 50 years. At the heart of the Ecosystems and Society and Third Pole projects is the merger of physical and social sciences in an effort to study the big picture and produce research results that impact society. Both projects involve physical scientists and economists working towards the same end—new and challenging territory that Grogan is directly involved in through her work with economists at Penn State, which is also a partner institution in the Third Pole project. “It’s been really interesting working with the economists at Penn State and seeing how these two very different fields that have totally different vocabularies and world views come together to answer questions we really couldn’t answer if we each worked on our own,” Grogan says. When she wraps up her Ph.D. in the next year or two, Grogan will carry on with her focus on modeling since, as a self-described “very quantitative person,” she likes the idea that she can ask questions and test hypothesis in the model world that couldn’t be done in the real world. She adds that her time in Japan was more challenging than expected and gave her a new level of respect for foreign students who come to the U.S. to study and do research.